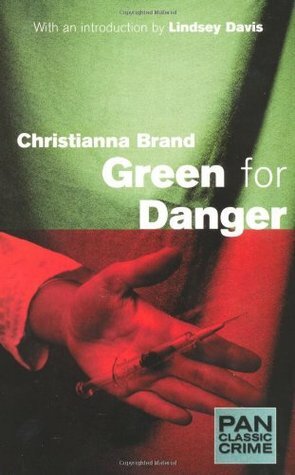 In my review of the book, I praised the characterisation, fiendish plotting, multitude of red herrings, and the authentic feel of a military hospital operating during the Blitz. I also criticised it a little for being too drawn out towards the end. So these were the things for which I was particularly looking out when watching the film. With a fairly short running time of just on an hour and a half, the film necessarily has to do quite a bit of squeezing to get the whole thing in. 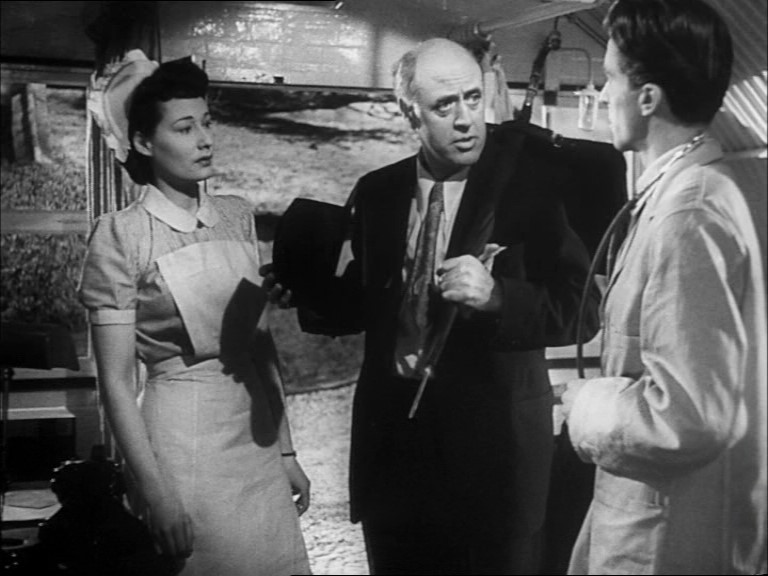 And with a major talent like Alastair Sim in the role of Inspector Cockrill, it isn’t surprising that he becomes the central focus. First off, the film cuts two characters out completely, moving their actions onto other characters. I must say the writers do this seamlessly so that, if I hadn’t been making a direct comparison, I doubt I’d have noticed that anything was missing. It does have the effect of removing one of my favourite red herrings, though – the one I thought for about half the book was going to be the real motive – but on the upside, it also removes a bit of romantic hoohah that had felt contrived and unrealistic in the book, so the seesaw remains pretty balanced. They all look so innocent, don’t they? In the book, the suspects’ characterisation is very well developed. These seven people have all become friends and, in some cases, lovers, and each person is so well drawn that the reader cares about what happens to them. In the film, the characterisation is much more superficial – in fact, for a good half of it I was continually mixing up two of the women, since they hadn’t properly developed as “people”. In a sense, they feel more like chess-pieces being shoved around to move the plot along. Again, though, without comparison, this works fine – the film pushes on at a fairly frantic pace from event to event, making it more of a fun roller-coaster mystery thriller. 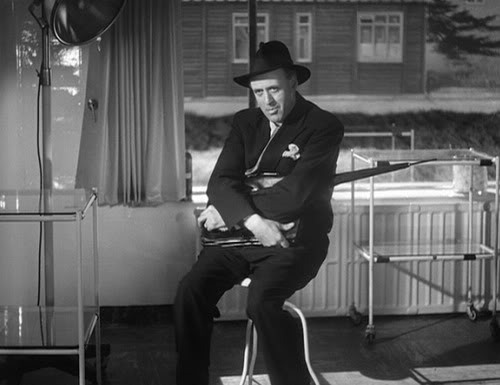 Cockrill becomes a kind of comedy character, as you’d expect with Alastair Sim playing him, but retains the intelligence he shows in the book, and adds a whole layer of rather wicked cruelty to the role, thoroughly enjoying how miserable and scared he’s making all the suspects. I thoroughly enjoyed it, too, I must admit! It’s an excellent performance – he doesn’t overplay it to the extent that it becomes farce, but it certainly changes the tone to being much more humorous than the book, which does take away a little from the depth of it, I felt. The standard of acting throughout is pretty good, although there was quite a lot of “eye-acting” going on – startled looks, suspicious glances, narrowed eyes etc. Since all the actors were at it, I assume it was a directorial decision. It made me laugh, but it all added to the melodrama. Trevor Howard and Leo Genn, as Dr Barnes and Dr Eden, are both excellent as two men interested in the same nurse, Esther. Poor “Barney” is deeply in love and wildly jealous, while for Dr Eden the whole thing is meaningless – he’s just enjoying winding Barney up. 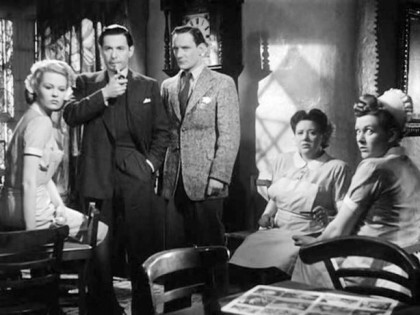 One of the funniest scenes in the film is when they eventually come to blows, and Alastair Sims pulls up a chair to sit and watch. 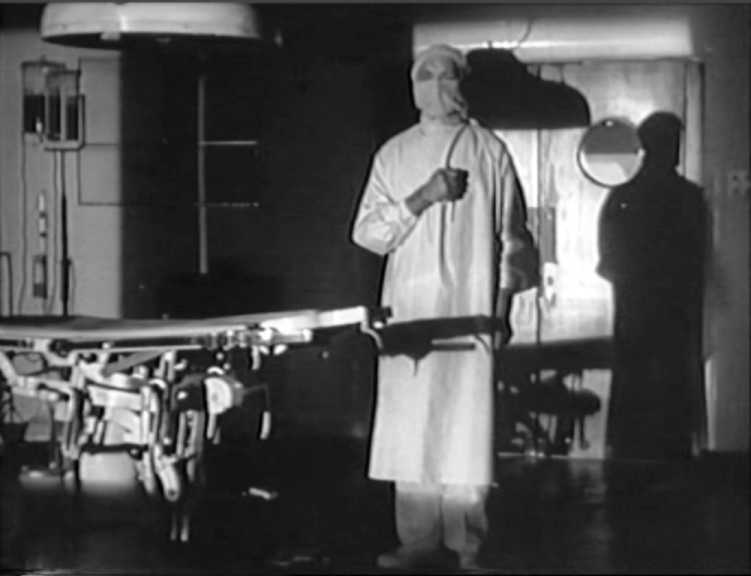 Nurse Woods, “Woody”, was my favourite character in the book, and while I enjoyed Megs Jenkins’ performance, the writers had removed all the underlying pathos from her character, leaving only a rather sensible school-marm type behind. Judy Campbell plays Sister Bates as a kind of semi-demented, jealousy-ravaged maniac, slightly over the top, but a good deal of fun. The other two women, Sally Gray and Rosamund John, didn’t register highly for me, partly because of the way their parts were written, and partly because I found the performances weren’t as strong as the others. Overall, the book has far more depth of characterisation and gets the war-time atmosphere over much better, both of which add a lot of moral ambiguity to the motivation which the film misses entirely. However, I enjoyed the film loads. It sticks pretty closely to the plot and keeps enough of the red herrings to make it a proper mystery. It’s much faster paced, and Sim’s performance adds greatly to the jollity making the whole thing feel like a real romp! One I will undoubtedly watch again when I need something light and thoroughly entertaining. How can I not give a cheer for the book as winner. Particularly as I really am rather tempted to read it, following your review. O should I say review of book and comparison review. Especially as I’m intrigued to discover your favourite red herring (though I might have to watch the film as well to spot its vanishing. So, is that herring decorated with fried tomato, herring liberally coated with red pepper relish? Herring and beetroot? A Kipper Tie identifies the villain! Must get hold of the film – sounds just the thing for a rainy afternoon! Haven’t seen this one, but it sounds highly entertaining. Of course, I haven’t read the book, either, so I have nothing concrete to go on there. Still, I do love a good mystery, and it’s great to find one that adheres to the standards (red herrings and all!). And what a naturally creepy setting a hospital can be!! Thanks for the recommendation, FF. Chocolate. Definitely, chocolate. And lots of it!! I admit, FoctionFan, that I haven’t seen the film. But from your excellent description, I can imagine the changes you’re describing. I think I would probably prefer the Cockrill of the book, who’s got less of a comic touch. But still, it sounds as though this is a solid adaptation of the book. And the changes don’t seem to have really detracted from the guts of the story. Anything with Alastair Sim is always essential viewing, I’ve seen the film but have never read the book! 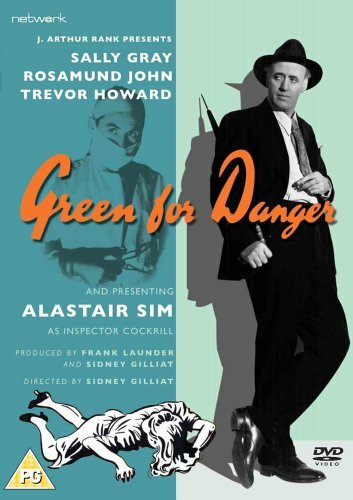 I hadn’t seen it before, but it’s one I’ll definitely watch again – great performance from Alastair Sim! “Eye acting,” eh? Cue the hisses and boos. I’m not sure I’ll be watching this one, although it does sound entertaining. I really want to read this author’s books, so I’m glad the book trumps the movie. By the way, I didn’t know she was the author of the Nurse Matilda stories. No, no! Isn’t fair. I call for a re-thingy. See…what would happen if you watched the movie first then read the book? It might be the other way around, I say. Sally Gray! Aha, the last name is spelled right. Woohoo!! I’m all of a doodah now!